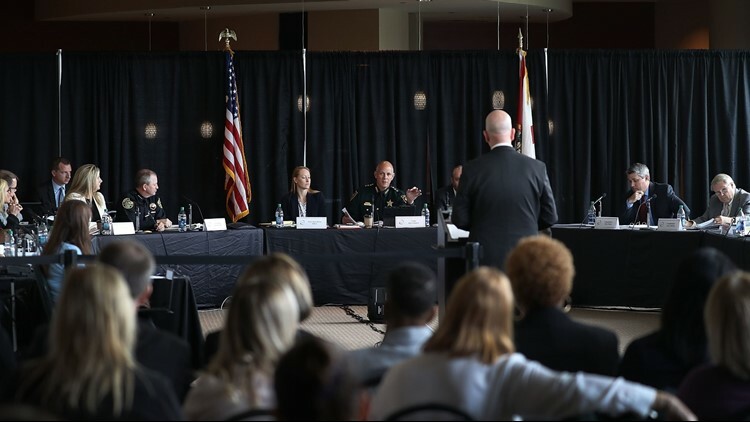 Pinellas County Sheriff Bob Gualtieri (C) speaks during the Marjory Stoneman Douglas High School Public Safety Commission meeting at the BB&amp;T Center on June 7, 2018 in Sunrise, Florida. Pinellas County Sheriff Bob Gualtieri says Florida's mental health laws wouldn't have stopped the Parkland shooter from buying firearms. The sheriff overseeing an investigation into the Florida school massacre says the state's mental health evaluation law would not have prevented suspect Nikolas Cruz from buying guns. Pinellas County Sheriff Bob Gualtieri said Thursday that some people believe that if Cruz had been subjected to the state's Baker Act, he would have been banned from purchasing weapons. He called that "flat-out erroneous." Under the Baker Act, Florida can involuntarily commit a person for mental health evaluation for up to 72 hours. A police officer, judge, doctor or mental health official must believe the person is mentally ill and a near-term danger to themselves or others. School and law enforcement officials considered committing Cruz under the Baker Act in 2016, but did not. Even if he had been, Gualtieri said he still could have bought a gun. Gualtieri is chair of the Marjory Stoneman Douglas High School Public Safety Commission, which meets once a month for three days. The commission was wrapping up its latest meeting Thursday with a discussion of the state's gun and mental health laws.